Scott and I made a wedding website for our guests to use as a resource for all of our wedding details and to assist them in planning their vacation to the Rockies. Okay, let me rephrase, Scott did most of the work, I just did the proofreading. He should get most of the credit. Anyway, one of the pages on our site included stories - stories of how we met, Scotts version and mine; and the story of our proposal. Each story is special to us and although our wedding website will not be active forever, I wanted a place to keep them. I wanted to remember them. I wanted to have them for our kids to read one day. And right here -on my blog - seemed like the perfect location. Without further ado here is the story of how we met. I met Scott during my 10th grade year of high school (during the BG vs Altoona basketball game to be exact). We spent quite a bit of time together that Summer and usually "double dated" with Jenna Ciambotti and John Siedel. We were young and it was fun. But as most summer crushes come to an end, so did ours (without one stinkin' kiss, I might add). We went separate ways, found new crushes, and I never heard much about him. Fast forward to St. Patty's Day 2007. I had just returned from a Spring Break vacation and was not quite 21. Sitting alone at my house, I receive a phone call from Jenna, telling me, "You will never believe who is at the bar with me! You need to get over here." 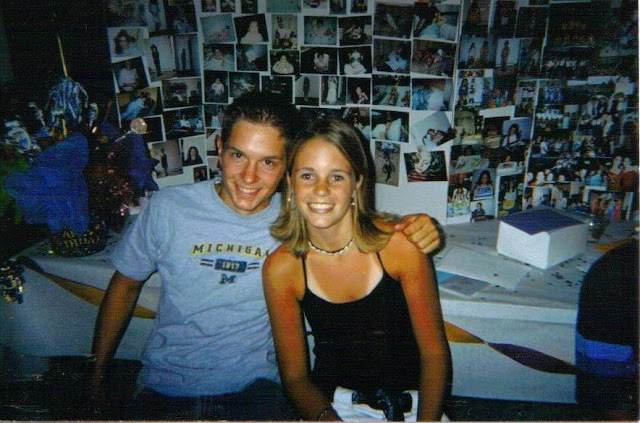 My curious mind was going in a million directions - but turns out, it was my long lost summer crush, "Scott Bores." I jumped in my car, snuck into the bar, grabbed a green beer and said hello to my future husband. We quickly discovered we were living less than a block away from each other and didn't waste any time catching up from the previous 5 years. We hung out for almost an entire year as friends (with a few kisses in between) and finally gave ourselves a "title" during a weekend getaway to Baltimore. Eleven months later he followed his dream and moved to Colorado. Six months after that, I followed my heart and moved with him. We rented an apartment and a year later bought a house. We adopted a dog, we got engaged... and the rest as they say, is history, history still being written. I met Kylie back in the 10th grade in the great city of Altoona, PA. Since we went to different high schools we didn’t see each other much but spent that summer together. Then… she left me for another guy. I found out that she was living only a block away from the house I was renting in college. This made it very easy to stalk my future wife. The next two years we finished Penn State together and became closer and closer. The time came when college was over and I was ready to leave the great state of Pennsylvania. Heading west was a big hurdle in our relationship. Luckily for this guy… Kylie was crazy enough to follow a guy like me. As our love story continues, I hope I am always crazy for you. Crazy as I was, the day I met you, the day we met again, and the day I moved 1500 miles away from home for you. I heart you, Mr. B.